Not what you want to see first thing in the morning when you sit down at your computer to start work, right? This was my morning. Before breakfast. Before coffee. Not my favorite way to wake up, I’ll tell you. I didn’t panic, though. Why? I have backups. LOTS of backups. My backups have backups. Anyone who knows me has heard me harp on keeping backups. 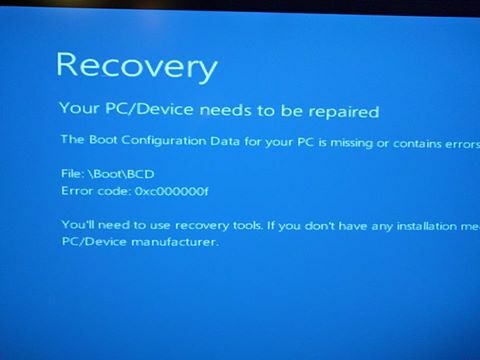 It took about two hours to recover from a complete failure of the operating system. I’m still not sure what happened, but I’ll be keeping a very close eye on my computer over the next few days! If I hadn’t had a backup, I would have lost the better part of a day re-installing Windows and all of my software, plus the documents I had on my computer at the time. I keep most of my documents backed up on Google Drive, so I would have been ok there (backups!) and not lost anything. What exactly IS 3-2-1 backup? I know a lot of you have heard me talk about 3-2-1 backup. A 3-2-1 backup strategy means having at least three copies of your data, two of which are local but on different devices, and one of which is offsite. Imagine you have a document that you’ve spent all day creating. I just finished a flyer that took me several hours to complete. This flyer lives on my computer in my Google Drive folder (which is incidentally backed up to the cloud). Our server backs up our computers at least once a day, so I have a second on-site copy. CrashPlan backs up my computer to the cloud continuously, so there’s my offsite copy of the file. Three copies, two on-site, and one offsite. Why two onsite and one offsite? When you back up your computer locally, you have instant access to that data in the event of a crash. Whether you have it on a local server or a backup hard drive, that copy is right there, instantly, for you to recover. There’s no waiting for a download, or for your offsite service to send you a hard drive with your files on it. If you remember to keep a recent backup, the odds are that you’re not going to lose anything (or very much). The downside to having your only copy of your data onsite is that it’s susceptible to whatever might happen to your primary copy. If someone steals your laptop, odds are they’re going to take your external hard drive as well. If your office has a fire, there goes your data. Is any backup strategy perfect? Nope. But if you have redundancy, the odds are much better for you to get your data back intact. All it takes is one significant data loss to understand how important backups are. If the data loss is bad enough, it can cost you a considerable amount of money, or it may cost you your business. If you’re fortunate, all you’ve lost are your irreplaceable pictures (ask me how I know). Take the time now to set up a backup solution. It is never too soon. Don’t wait until you’ve lost valuable information to look into making backups. Do it now. There is no such thing as “too much backup”. Need help? Give us a call today at 970-639-0629 for a free consultation on a backup strategy for your business or home.